But, before I get to that, I think a little family history is needed. 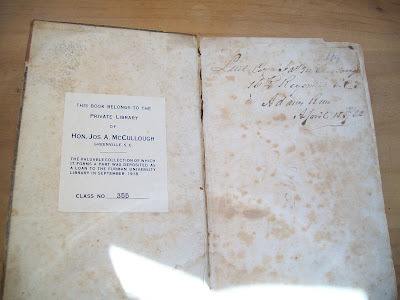 The first McCullough of my line came to America in the late 1700s. This man, the ‘original’ Joseph A. McCullough as he’s known in my family, bought a farm in South Carolina and became famous for breeding horses. By the time the Civil War broke out, that farm had become a small plantation, complete with little shacks where the slaves slept. My great (x3) grandfather, James McCullough, who owned the farm, joined the Confederate Army. For most of the war, he was a colonel in command of the 16th South Carolina Volunteers, part of States Rights Gist’s Brigade. He led the regiment in several battles, most notably around Atlanta in 1864. Soon after that, however, he left the Army and returned home. No one in my family seems to know the reason for this, but it probably saved his life. The army next fought at the Battle of Franklin, where the Confederates suffered one of the most devastating and complete defeats of the entire war. States Rights Gist was killed, and every officer in his Brigade above the rank of Captain was either killed or wounded. After the war, the farm fell into disuse, and my grandfathers instead embarked on careers in law, politics, and the military. That is until my grandfather (also Joseph A. McCullough) came back from World War II and decided to give farming another go. My father was born and raised on that farm, and every summer when I was a kid, we would go there to see the family and roam through endless acres of South Carolina forests and fields. One day, I was poking through a dusty book shelf in my grandfather’s house and saw an old battered book with ‘Army Regulations’ on the spine. Opening the book to the title page, I saw that it was ‘Regulations for the Army of the Confederate States…published in New Orleans in 1861’. I think my heart actually skipped a beat! Flipping back to the inside cover, I examined the book more carefully. On the inside front cover is a book plate which declared the book belonged to the ‘Hon. 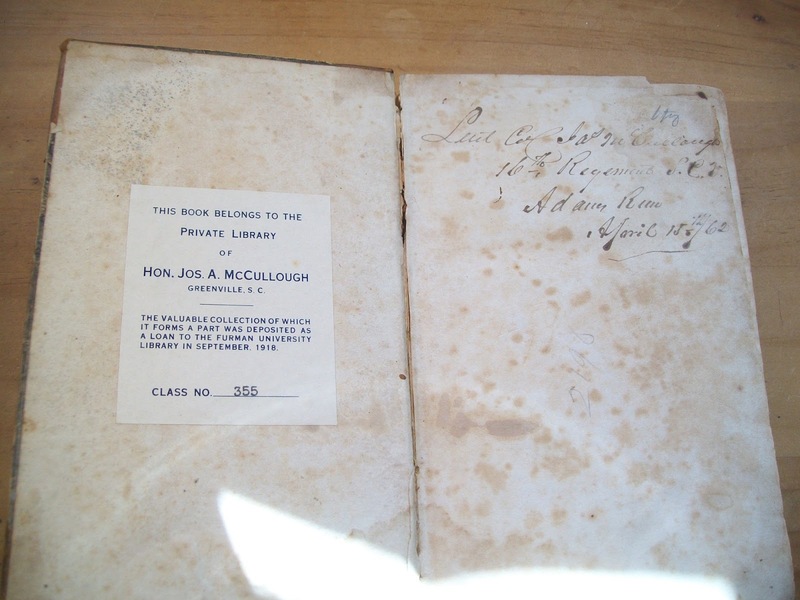 Joseph A. McCullough’ and was deposited as a part of a collection with Furman University in 1918. (Just because there aren’t enough Joes in the story, this one is actually my grandfather’s grandfather, generally called ‘the Judge’ to avoid confusion). But, what is more astounding than this book plate, is the inscription opposite it. It reads ‘Lt. Col. James McCullough, 16th Regiment SCV, Adams Run, April 1862’. Thanks to the Complete Records of the Civil War, I have been able to confirm that the 16th S.C.V was stationed at Adams Run in April of 1862. On the next page spread, which contains no printing, the book has been signed again, in the same hand, ‘James McCullough, Lt. Col. 16th S.C.V’. Both of these signatures were done in brown ink that has soaked through the page. The book itself is pretty dry, as you would expect from an army manual, but also filled with interesting historical details, such as a Rank and Command list – who knew that Hospital Stewards held the same rank as an Ordnance Sergeant? Instructions on how to organize the troops, write down orders, issue ammunition, fight battles, organize wagon convoys, the proper style of uniforms, and finally a section of blank forms for all kinds of things including forms for pay and discharges. It’s not until we get to the last very last page that we, once again, encounter my ancestor. On this last page, he has signed the book twice, once in ink and once in pencil. This time, in both instances, he is ‘Col. James McCullough’. There is also an extremely fine, and faint, bit written in pencil at the top of the page. 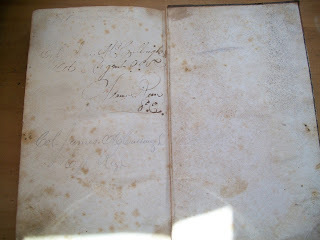 Despite several attempts, the only thing I might be able to make out is the name at the end, which might be ‘Col. Ellery’. The book is in poor shape these days. 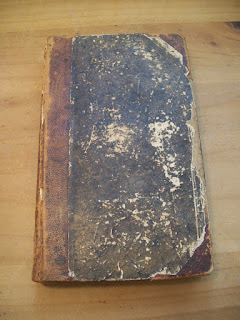 I’m not sure how much longer the cover will remain attached, and the pages are all slightly warped from moisture. Still, they made books to last in those days, and I have little doubt, that baring outside damage, it will still be around when I am gone. I have tried to. It is my prize possession – a direct link to my ancestor and to a horrendous yet compelling war. My grandfather’s farm was divided amongst his children after his death. My father owns a part. My uncle (yup, Joseph A. McCullough) owns the part that contains the family graveyard. In the midst of that graveyard, under a small monument, lies Col. James McCullough. I hope he is at peace. 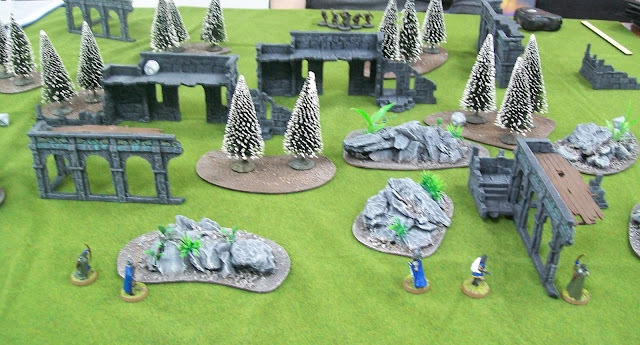 A couple of weeks ago, in a post that mostly got noticed for other reasons, I reminded myself that I should make some terrain. It’s a part of the miniatures hobby that I used to enjoy, but have gotten away from in the last five or six years. 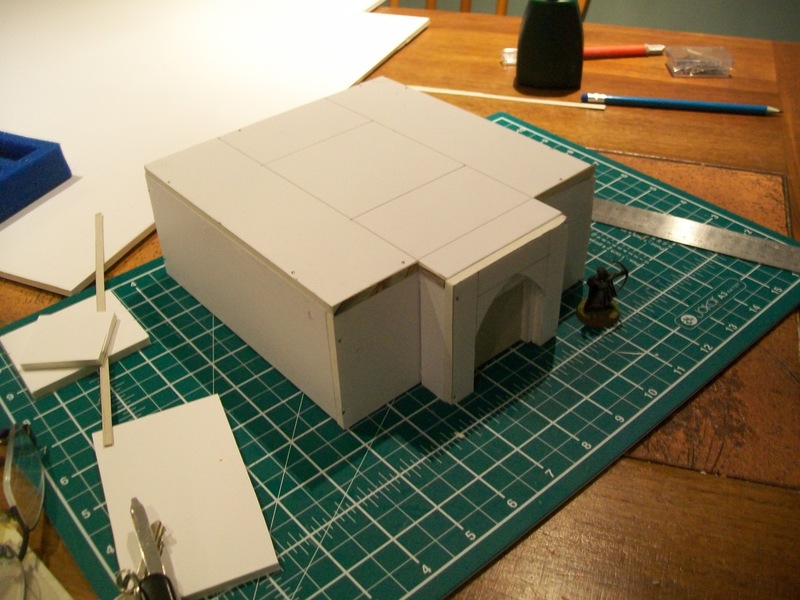 So, I went out and bought a big sheet of foam board, and then stared at it blankly for a couple of days. Seeking inspiration, I started flipping through some old gaming magazines. I found what I was looking for in a couple issues of the old Battles Games in Middle-Earth. One contained instructions for building a Gondorian Fortress, which can be seen here. The other had instructions for building an Osgiliath tower. I really like the look and idea of the first, but figured it was way too advanced for the present. So, I decided I might try to combine the two, and make a fortified tower. Well, at first, I thought I would make a fortified lighthouse/beacon tower for Dol Amroth, but decided I would make it more generic so that I could use it for Middle-Earth, Ghost Archipelago, and even Frostgrave. Construction has begun. I’m working on the base level first. I might even see if I can make it so that the tower itself is detachable, so that I can just use the base as a small fort. I suspect this project is going to take quite some time. I have no deadline, and I’m not going to rush it. The photo shows what I’ve managed in an hour or so of work. It has its frustrations - a miss cut by only a millimeter or two can throw the hole thing off, but, none the less, I am really enjoying the act of creating! Seeing them coming, Belagus ordered his men to take defensive positons, while Eldamir and Caellen went to work. As the orcs charged, the brothers let fly with their arrows. In minutes, two orcs were down, and another was badly wounded. Then the orcs were upon them. Both Coric and Levant were battered back, and even the brothers were forced to join in the desperate fight. Only Belagus stood his ground, his blade flashing this way and that. Just when it looked like the small party might be overwhelmed, Belagus cut down an orc and the rest fled in panic. Taking stock, only Coric was badly wounded. The party waited a day while Coric recovered, then hurried on their way. Eventually, they reached the outpost and delivered their letter. They stayed at the outpost for a few more days, then set-off home. 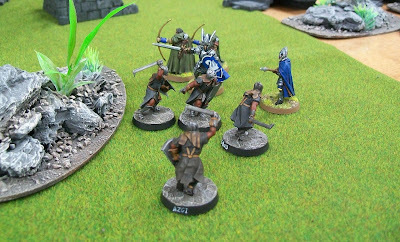 Two days out, they were ambushed by the same group of orcs. This time, the fight went against them. The orcs came at such speed that bows were useless and the fighting became desperate. Just when the fight looked bleakest, the orcs, apparently having accomplished what they wanted, retreated in an orderly fashion. Although everyone lived, the small party was in bad shape. Coric’s leg had been smashed, and Caellen had suffered a nasty sword cut to his side. Although he claimed to only have suffered small cuts and bruises, Belagus realized he had reopened the old wound that had pulled him from the front lines, what seemed a lifetime ago. 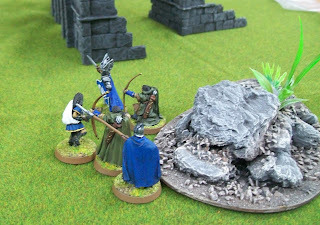 Last Friday, I met up with a friend and got in two games of the new Middle-Earth Battle Companies. I brought my Dol Amroth battle company, and he brought his Uruks. He had the advantage of numbers, 7 to 5, but I had a slight advantage in both archery and armour. For our first game we rolled the ‘Messenger’ scenario. Basically, we each secretly named one of our figures to be a messenger and were supposed to keep this figure alive while killing the enemy messenger. I chose ‘Levant’ as my messenger, which was a classic case of out-smarting myself, as this was probably the worst choice. I would have done better naming Belagus (who had the highest armour) or one of the rangers who were less likely to get involved in hand-to-hand fighting. Anyway, when the game started, I went on the defensive. I slowly moved my company back and around to the right, trying to keep the Uruks out of charge range, while my rangers went to work. The tactic worked pretty well. The rangers downed two Uruks and wounded one of the heros. But then they were on me. The hand-to-hand fighting went poorly for me, and Coric fell at first contact. Levant slew an orc, but then fell to the next. Belagus killed another orc, but had to rely on his heavy armour to save him. After a few turns, I was down to just Belagus and one ranger, while three Uruks were left. Then, in a horrible display of dice rolling, my opponent failed his courage checks for all three Uruks and they fled the table. Both of us had lost our messengers, so technically the game was draw, but since I held the field, it felt like a win. We both claimed a reward of 3 Influence points. Coric received an ‘Old Battle Wound’. (Meaning he has to check before each game, missing it on a roll of a ‘1’). The Uruks had one guy suffer an arm wound, meaning he could no longer carry a shield, and another one would have to miss our next game. We decided to immediately play another game. I was feeling pretty good about this. Coric passed his roll, and with the Uruks one down, I was only outnumbered 5 to 6. 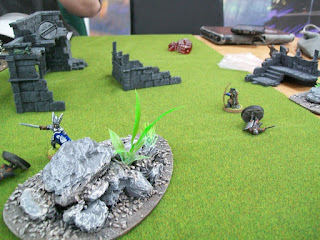 Unfortunately, the scenario we rolled, ‘The Relic’, basically prevented me from using the same tactics for game two. Anyway, the game was a disaster for me, so I won’t go into details. Belagus, Coric, and Eldamir all went down before I caused a single casualty. With the Uruks already making off with the relic, I conceded the game. The post-game also went very poorly. Belagus picked up an ‘old battle wound’. Coric got a Leg Wound (-1 Move), and Eldamir has to miss the next game. Sigh. I claimed my 2 Influence points for the game and limped away. When it came time to spend my Influence, my bad luck continued. I paid 3 for a roll on the reinforcements chart and got a ‘1’, which is nothing. Thankfully, I was able to spend another point to increase this to a ‘2’, so I could recruit another Men-at-Arms of Dol Amroth. I spent the last point getting some Heavy Armour for Coric as his poor Armour score twice proved his undoing. None of my men gained enough experience to make any advancement rolls. All-and-all, not a great showing for two games. Still, no one is flat out dead, and we’ve added another heavy armoured trooper which should help. My company rating stands at 102. Most importantly, I had a lot of fun. The games were extremely quick. We finished both, with lots of pauses for chatting, in two-hours. In fact, we probably would have played a third, but both wanted to have a pause to get our new men/orcs painted up. Spellcaster Print-on-Demand is a Go! 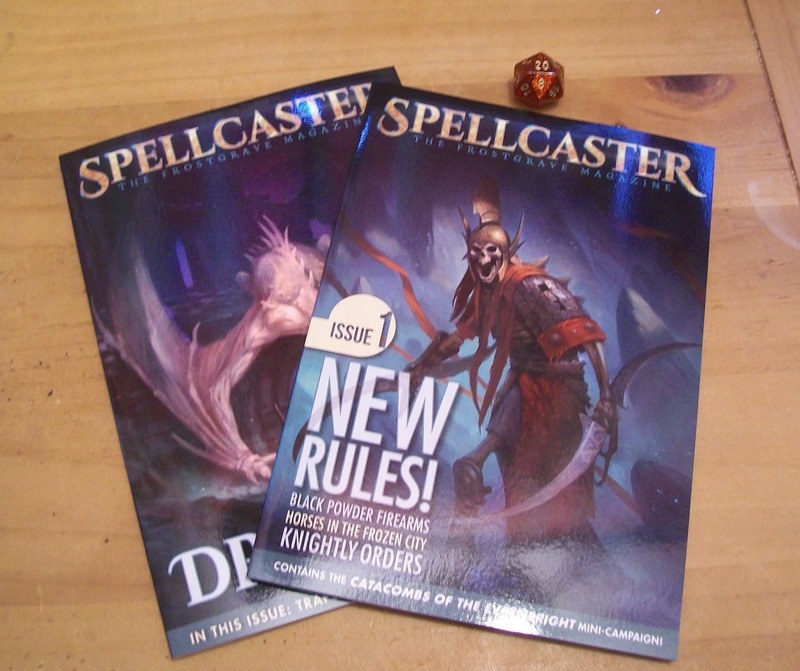 It is with great joy (and a little relief) that I can finally announce that both issues of Spellcaster: The Frostgrave Magazine are now available as print-on-demand booklets from RPGNow! I’ve got copies of both sitting on my desk, and they make an attractive little set (if I do say so myself). Once again, I would like to thank all of the people that have helped with Spellcaster - Andrew Vallas, who has done the internal design and production work; Steve Meyer-Rassow, who created the logo and worked on the cover designs, and Dmitry Burmak for his fantastic cover artwork! A few weeks back, I ordered a copy of the new Middle-Earth Battle Companies rules from Games Workshop. I was supposed to have my first game today, but that had to be cancelled because it is too dangerous to walk out my front door. An hour ago it rained for 10 minutes and left a deadly layer of nearly invisible sheet-ice over everything. Oh well, we rescheduled, and I will just have to blog about my Battle Company instead. As soon as I got my copy of Battle Companies, I knew I wanted to make a Dol Amroth company. 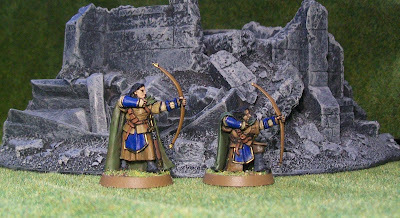 The Swan Knights have always been one of my favourite parts of The Lord of the Rings, and I quite like the figures that Games Workshop have produced for them. Dol Amorth (technically 'Fiefdom') Battle Companies are all lead by Swan Knights, which is appropriate and what I wanted anyway. I am not the best at painting armour, but I really took my time with Belagus, trying to work his armour into a glorious shine. Otherwise, it was a very simple figure to paint, and the results are mightily pleasing. Next the Dol Amroth Battle Company calls for two 'Men-at-Arms'. This immediately presented me with several problems. First, I didn't have any 'Men-at-Arms', and while I could have ordered some, I didn't want to, for two reasons. 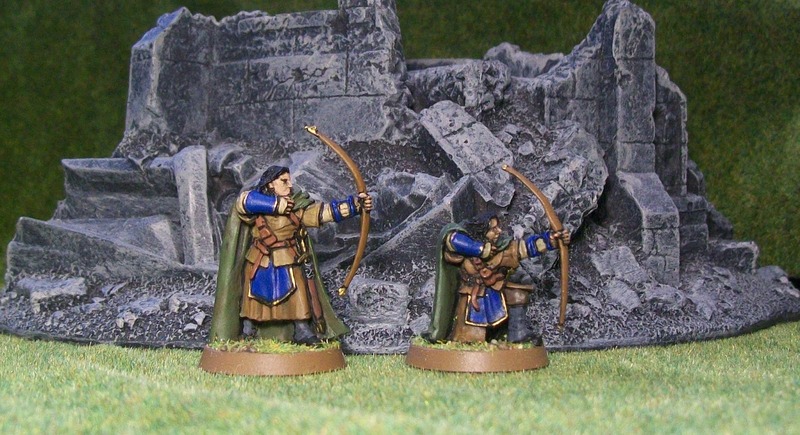 First, you can only get Men-at-Arms in finecast, a material I avoid whenever possible, especially if the figure features a long bendy weapon, such as a pike. And there was my other problem. I hate pikes on miniatures. They are just awkward. Plus, I'm building a battle company that currently has 5 guys; why would two of them be carrying pikes? I guess that might make sense if they were on a ship (a definite possibility for Dol Amroth), but at any other time, just about any other weapon would be more practical. I solved this problem in two different ways. 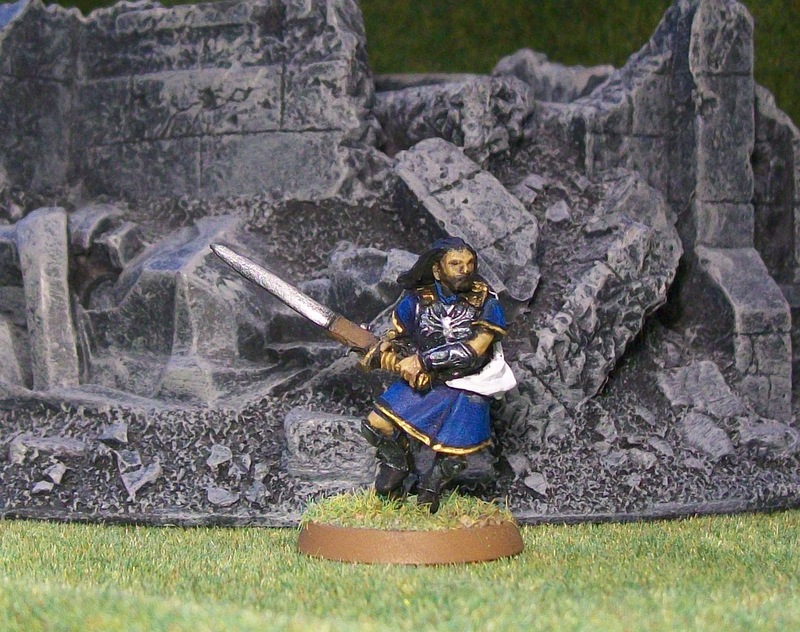 For my first Man-at-Arms, I used a Minas Tirith Citadel Guardsmen with a spear. By changing out the traditional black for Dol Amroth blue, the figure fits right in. The spear is close enough to a pike without the super annoying storage issues, and, best of all, I already had the figure on my lead pile waiting to be painted. For the other Man-at-Arms, I decided to trade him out for a Clansman of Lamedon. Well in my case, a Warrior of Dol Amroth who favours a big two-handed sword. As far as the rules are concerned, this switch is kind of semi-legal. There are two ways to assemble companies in the game, and I'm kind of mixing them. Anyway, the Clansman is, for the most part, a less powerful figure, and my opponent agreed, so there you go. Plus, I had this figure, which I painted several years ago, ready to go! Finally, I needed a pair of archers. I had an old 'Faramir's Ranger' figure lurking at the bottom of my lead mountain. He has honestly been there for years, and I don't know why I haven't painted him. Well, I did, and in fact, I enjoyed it so much, I went to Ebay and bought a second one to finish off the company. So here's Belagus and his boys. Hopefully we'll be hearing more about their adventures in the near future! (The only thing I don't like about this Battle Company - Belagus is bravely pointing one way with his sword, while every other figure is facing the other way!). Just finished painting this little ghoul, another terrific Bobby Jackson sculpt. 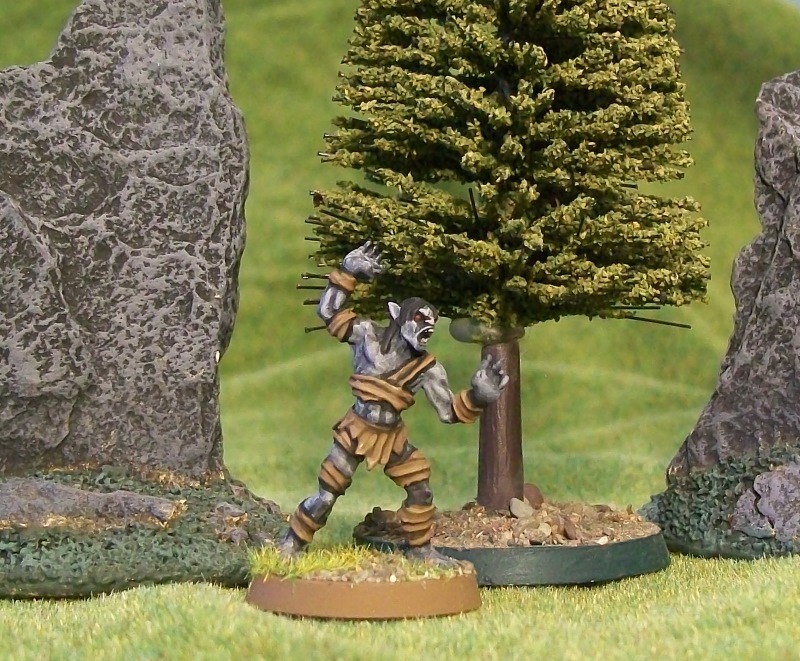 This figure was created to do double-duty as ghouls appear in both Frostgrave and Ghost Archipelago. In fact, if I really stopped and looked, I suspect I have included low-level undead creatures (skeletons, zombies, and ghouls) in a disproportionate number of the scenarios I have written. It's really just blatant necromancer favouritism. I think I have just always considered these creatures the perfect bad guys. Not only are they inherently horrific, but, because they are literally soulless, there is no morale ambiguity in their destruction. Since they are anti-life, taking one down is winning a victory for life itself. They aren't misunderstood, or the products of bad childhoods, or just killing people to try and feed their children. They are just bones and corpses trying to make more corpses. Anyway, a quick a figure to paint, as it really features only too main colours, although this did make it easier to concentrate on getting some good layers and highlighting, which I think really make the figure pop.